All aboard! 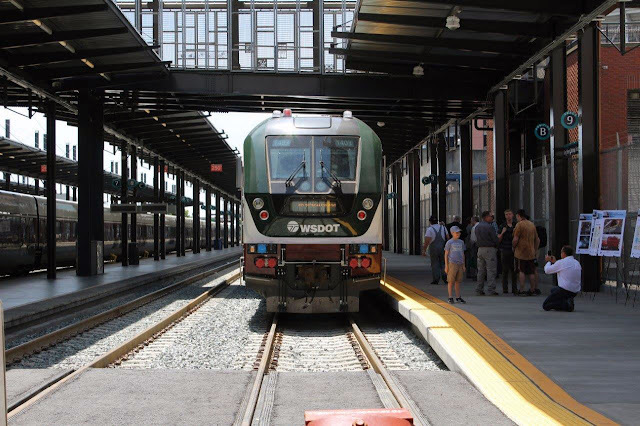 Starting this week our new state-of-the-art Amtrak Cascades locomotives are rolling on the tracks from Vancouver, British Columbia to Eugene, Oregon. The eight Siemens Charger locomotives are significant upgrades from our existing machines. They meet the strictest Environmental Protection Agency emission standards and are lighter and quieter. They also provide greater rates of acceleration and top speeds even though they’ll only be travelling up to 79 mph on our route. In addition, the locomotives include computerized on-board positive train control safety equipment, which will automatically stop the train when there are dangerous situations on the rails, once the system is activated corridor-wide next year. The locomotives, which boast 16-cylinder, 4,400 horsepower Cummins engines, also will be more reliable than the existing aging fleet and will be used on all routes. Our new locomotives, seen here at King Street Station earlier this year, started running this week. and ODOT logos, for the two states that support the service. The public got a peek at the new locomotives during a May unveiling at Seattle’s King Street Station. Since then they’ve been undergoing field modifications and acceptance testing to ensure everything operates safely on our corridor. They’re now ready for their official debut in revenue service and will be phased in to all Amtrak Cascade routes during the next few weeks. The American-made locomotives feature the traditional evergreen, cappuccino and cream Amtrak Cascades colors, along with logos from Washington and Oregon -- the two states that jointly own and manage the Amtrak Cascades service. The paint colors, inspired by the Pacific Northwest, coordinate with the exterior paint on the existing Amtrak Cascades trainsets (passenger and baggage cars) used throughout the Amtrak Cascades system. 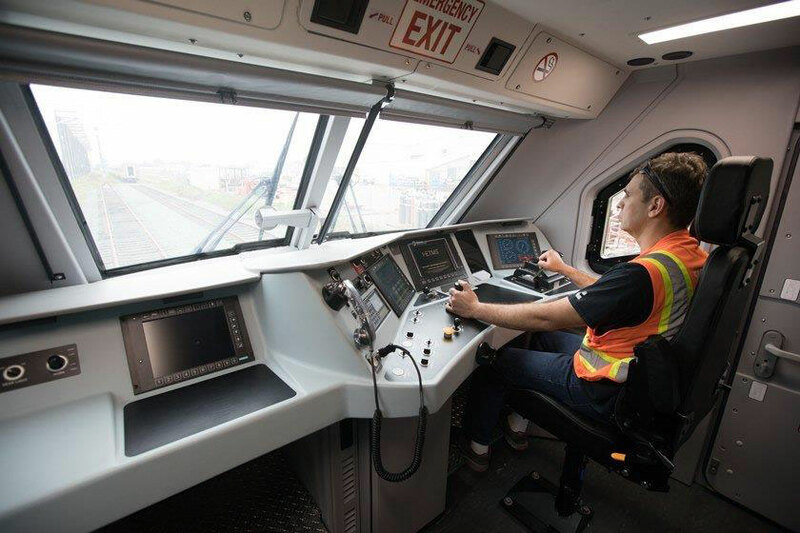 This interior shot of one of our eight new locomotives shows the locomotive control panel during initial testing. All the Amtrak Cascades trains operate in a push-pull configuration that allows them to make a roundtrip without turning the train around. Initially, the trains will run with a new locomotive at one end and an older locomotive on the other end. This is part of the final process to break in the locomotives. Therefore, sometimes you’ll see the new locomotives pulling the train from the front and, at other times, they’ll be pushing the train from the back. The existing Amtrak F-59 locomotives will be phased out of service on this corridor over the next year. and are now moving into service along the Amtrak Cascades corridor. The additional trips – one in the morning and another in evening each direction – mean heading to Portland for a quick business meeting or Seattle for a fun day trip will be easier and all travelers will now have more options. So, the next time you catch a train, or just see one passing by, take an extra moment to check out the new face of Amtrak Cascades. I can't wait until they completely transfer to these! We need speeds higher than 79mph on this corridor. We are way behind the rest of the developed world when it comes to passenger trains. Steve, the speed limit on the tracks is set by the railroad owner – BNSF and Union Pacific – and not WSDOT. In July 2010, the state of Illinois and the Union Pacific Railroad reached an agreement under which track speeds between Dwight and Alton, Illinois were to be raised to as high as 110 miles per hour. These locomotives are a great step forward, and all of the track improvements between Portland and Seattle are really making a difference - Thanks! Hi WSDOT - are there any negotiations happening with the railroads to increase speeds on lower-traffic sections of the corridor? Thanks! It's great to see all these improvements coming to fruition, and I'm looking forward to quicker and more frequent trips! I think a 3-hour SEA to PDX trip would be a big milestone and would probably be the tipping point where a lot of drivers would seriously consider switching to the train. Up the top speed to 90 or 100 mph on a couple segments (especially next to I-5 where there's high visibility) and find some small time savings in the Columbia River area, and you're easily below that. Hey Chris Shotwell, thanks, we’re excited about the changes! Speed on the tracks is set by the railroads that own the tracks, not WSDOT. However, if the speed were to ever be lifted, our new locomotives are ready to travel at higher speeds and other track improvements we made would also lay the groundwork for faster travel. You might also be interested in an Ultra High-Speed Travel study we’re completing for the Legislature and Governor about even faster travel between Vancouver, British Columbia, Seattle and Portland. As to your second comment, right now we’re focused on the start of our expanded service between Seattle and Portland on Dec. 18. However, the new route in and out of Tacoma and some other track improvements will let the trains travel at faster speeds than they currently can on the route, though still with a 79 mph top speed. Actually, rail speed limits in the United States are regulated by the Federal Railroad Administration. Other states have worked to get higher speeds above 79mph for their passenger trains. Is it possible WSDOT will pursue this in the near future? While the FRA sets the maximum allowable speed based on design standards (track, signal, geometry), the owner of the track has full discretion to set the operating speed within that federal limit. (Sometimes that’s based on other track traffic, or in urban areas track owners often reduce track speed). Our recent work on tracks and signals – part of the overall $800 million in improvements – brought previously slower sections of the tracks up to 79 mph capability, which will decrease travel time between Seattle and Portland once the expanded service starts on Dec. 18. Are these model locos. used on the new Marin SMART? According to the Marin SMART website, their trains are a fleet of state-of-the-art diesel trains assembled in Rochelle, Illinois by Sumitomo Corporation of Americas, which would be different from our Siemens Chargers manufactured in California. They do appear to have the same EPA Tier 4 rating as our locomotives though. Six Siemens Chargers were purchased by CalTrans as part of our multi-state purchase agreement and are running on the Capital Corridor in California. Those trains are exactly like those at Amtrak Cascades, though with different exterior paint. 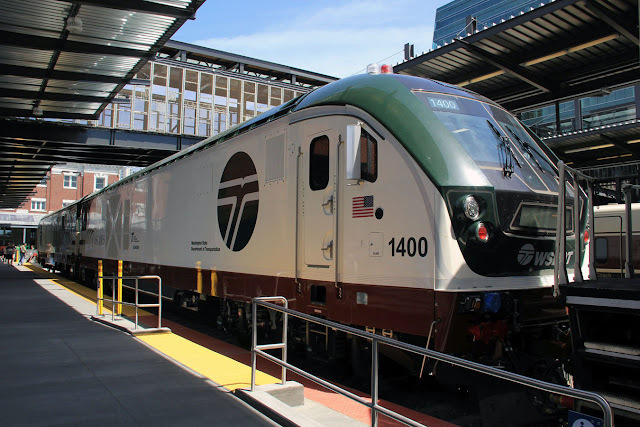 Quote: Amtrak Cascades rolled out eight new state-of-the-art Siemens Charger locomotives, which will be running between Vancouver, British Columbia to Eugene, OR, with stops in Washington state as well. This sentence makes it seem like our Washington is just an afterthought when, in reality, of course, we comprise the vast majority of this corridor, both in mileage and in patronage. Vancouver (BC) and Eugene are the afterthoughts. I wish any mention of this corridor would highlight the prominence of Washington and decrease that of these endpoints. Something like ....locomotives, which will be running on the Cascade (or I-5) corridor through the length of Washington and into Portland, Oregon, with continuing service to Eugene and British Columbia. Yes, I am sensitive to this issue! No, the speed isn't set by BNSF. It is set by the track capabilities designed by the Federal Transporation agency. Instead of forcing BNSF to deploy 300Km/hr capacity lines they've allowed low speed 1950s speed capacity lines to be retrofitted, thus saving BNSF [and the rest of the Rail Industry] hundreds of millions to billions in track renovations that are long past due. Until that infrastructure gets current 79MPH is the cap. With extensive electrification of UK western region, they are phasing out the most successful diesel powered trains ever produced. The push/pull HST locomotives would have gone great with the Talgo sets and could have been a bargain. Probably too fast for the service 125mph+ and not in compliance with union requirements.